Ah, Christmas in New York. There’s nothing else quite like it. Christmas in Chicago is pretty great, but Christmas in New York is more. I lived in New York City for many years and while we used to complain about the crowds every December, I would pinch myself daily during every holiday season. I still can’t believe I was so fortunate. It has been ten-plus years since I lived there and spent a Christmas season (I usually go in September when I visit now) and I can still smell the pine trees at the stand on the corner and the roasted chestnuts on every block. The city was so cozy and festive during Christmas (this is also what I love about Chicago). We’re finally making a quick trip to New York with my six-year-old daughter this year for Christmas. I can’t wait to show her all the Christmas decorations (including the big tree), the ice skating rink in Central Park (with hot chocolate in hand), the windows at Bergdorf Goodman (oh the windows at Bergdorf’s!) and lots more. I have so much on my list (including seeing my old office building and where I used to live) that I’m sure we won’t get to everything but New York is exactly our speed. I’m also eager for her to try her first New York bagel and have a pretzel on the street. 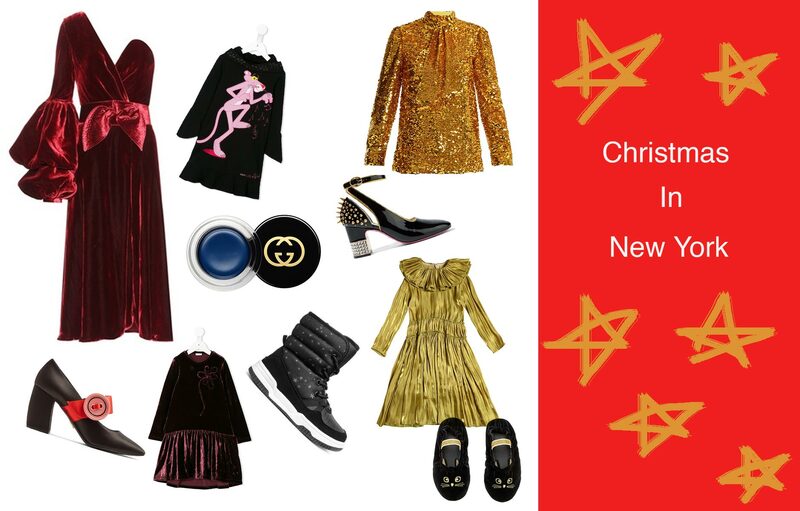 Of course, Christmas in New York requires bundling up (which I don’t mind a bit), but it’s also the season to sparkle and shine so we’ll go for as much glam as possible. Here’s my dream wardrobe for our fabulous weekend getaway. I hope to pick up a thing or two on sale before we go. What’s your favorite city during the holiday season?